Things go missing it's a fact of life, freak wormholes open up in the fabric of space/time and things slip through, they are lost forever. Now this is, as I said, a fact of life and it's something you can't really be vexed by. I like to think that I'm not an angry man unlike some of my collegues. Let me tell you how it is, years ago around the time of Star Trek Generations they released a game tie in (It wasn't bad for a Star trek game). The story of the game was similar to the film, but Soran had more stars to detonate, so there were more planets to save and more chances to thwart Soran. Each level you took on a different persona of the Enterprise D crew, I never managed to finish the game because of the final character you had to use. It was KIRK as voiced by SHATNER (readers will recognize my problems with this person). I'm sorry but I would put him in front a armed troop of angry Klingons, when he was only armed with a peanut for protection, or throw him into a boiling geyser or over the edge of a precipice, I just couldn't stop killing Kirk. But that was over one house move and three computers ago, it probably ran on windows 95 (or 98) and much to Adam's delight it wouldn't run on XP (we loaded an essential maintenance patch for XP recently, XP stopped running!). Besides we have lost one disc. The other thing I used to do was haunt a web site (smack Shatner). There used to be a picture of Admiral/Captain Kirk (in the movies red uniform). You'd press a button on your keyboard a fist would fly in and hit him in the nose; the wig would fly up and land over his eyes. I spent hours just pressing that button, at the time we didn't have broadband and dial up after a short while is very, very, very expensive. But what has brought on all these reminiscence's of the past. He's everywhere, everywhere I look, it's like the vibrating cup from Jurassic park, you can hear him approach, the ego sends trees crashing down in front of it. Its not as if I don't like Kirk and I understand that if you have one you have to have the other. I know that if I watch classic Trek I will see Shatner, I can prepare for that. But now he's Advertising Bran Flakes, that me he's popping up on my T.V. screen without warning, The T.V. is no longer safe and I don't mean in a scary nice way! I vow never to watch telly again, I can do that I'm strong. Imagine the scene early morning, me drinking my coffee, eating my Frosties at the table, listening to the radio with my wonderful, wonderful wife. 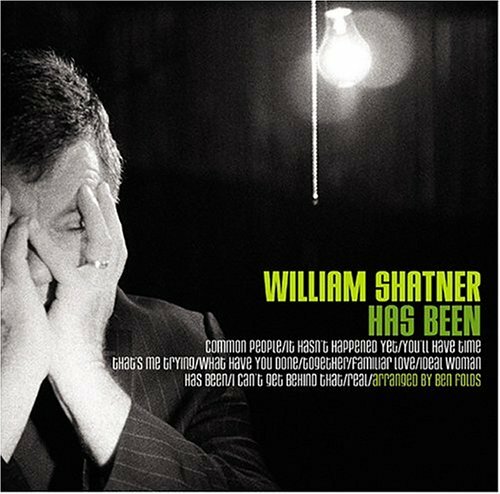 The next thing I know there he is smirking on the airwaves, no warning, no apology he's just there, Karen got covered in coffee, I'm still trying to apologies thank you so very, very much Mr. Shatner. As it is the radio as now in it's component pieces and we will no longer listen to its foulness again.